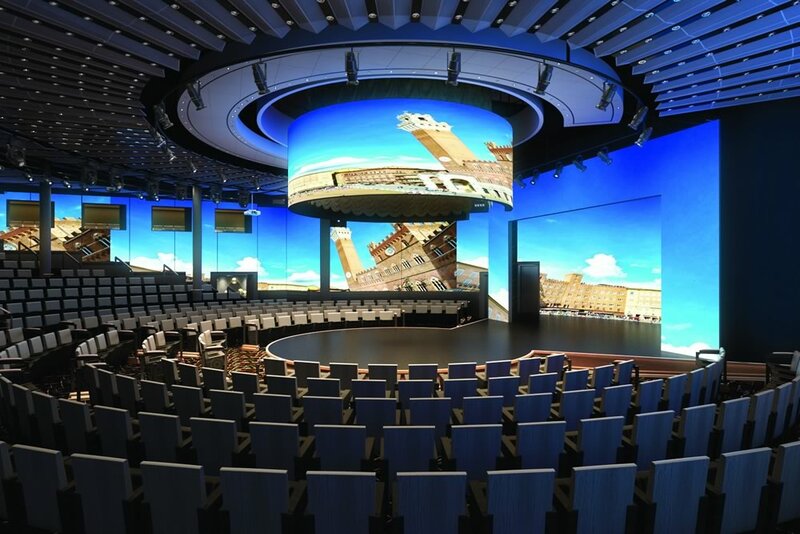 Holland America Line’s ms Koningsdam is to feature a 270-degree wall of high-definition LED screen in the main theatre, a set-up dubbed ‘The World Stage’. The innovative technology to be used will offer a more flexible space that can have multiple stage configurations, ranging from in-the-round to the more conventional proscenium staging. The screens span two storeys in height and 76 metres in length. The theatre venue will be enhanced by state-of-the-art lighting, projection and sound systems. The World Stage can change throughout the day to present anything the designers can imagine – for example, the venue can switch from an Italian palazzo for a concert performance to a setting more befitting a production show. The main theatre will initially host five new production shows. Also recently announced was the Music Walk area which will be home to a number of musical entertainment choices. The Lincoln Center Stage will offer nightly chamber music performances; Billboard Onboard will offer live performances from musicians; and B.B. King’s Blues Club in the Queen’s Lounge will offer the best of Memphis music at sea. Also recently announced were the installations of the Sel de Mer dining venue, a new French seafood brasserie, and an enhanced Culinary Arts Centre, which will now offer a farm-to-table dinner experience. These will be offered alongside the other dining venues on-board including the re-designed casual Lido Market; the main dining room; and favourites including Pinnacle Grill, Canaletto Italian restaurant and pan-Asian Tamarind. Earlier this month Koningsdam, a Pinnacle-class vessel, was floated out from its dry dock to the outfitting dock at the Fincantieri’s Marghera shipyard in Italy. Along with it came news that Koningsdam’s launch had been delayed. The maiden voyage departs from Civitavecchia (for Rome; Italy) on 8 April 2016.